I was woken at 5am by the sensation of having my face gently licked. I was hoping that "er indoors TM" wasn't getting any funny ideas, but it was my dog being excitable. He does that. Having been woken at 5am I should have stayed up, but I thought I'd have a few more minutes kip, and that was fatal. I was then running late for the rest of the morning. Martin arrived, and we set off to camp via Tesco for some supplies. No one told me that a small bit of halloumi goes a long way; I bought about four times too much. Notwithstanding surplus cheese we were soon at camp and it didn't take long to load up trailers. 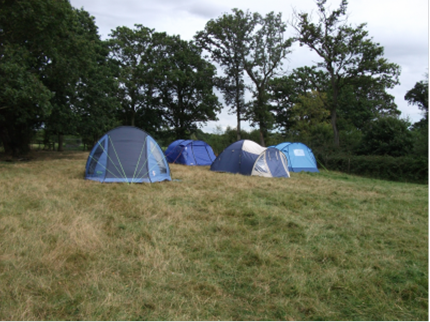 We took a little while to plan where to put our tents; there's no denying that there was an abundance of dung. 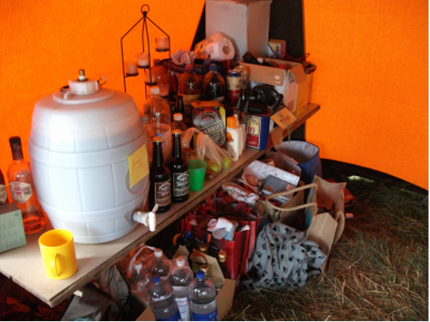 But once tents were up the halloumi was put to good use and a rather enjoyable lunch was had by all. Eventually we staggered off to bed shortly after midnight; pausing only briefly for the Rear Admiral to lose the impromptu farting contest. I woke for a tiddle at 3am; it was surprisingly cold. I had a vague idea to be up with the lark for a spot of early morning fishing today. By the time I'd overslept then had my morning ablution I eventually got to the pond shortly after 8am. I caught a few tiddlers and was contemplating making my way back to camp when Lisa and Earle wandered up with a cuppa for me. There was apparently little life back at camp so we carried on fishing until summoned for brekkie at 11am. Brekkie was rather good, and after washing up we all slobbed about for an hour or so. You can't beat slobbing about in a field. After a rather protracted slob we got up. Some had works socials to attend, others had beloveds to collect. Lisa, Earle and I had seen Egerton on a map and had planned a ramble round the area doing a spot of geocaching on the way. We had a really good afternoon in the sunshine; marreed only by the total loss of phone and internet and GPS signal (which did make geocaching a tad problematical). On the way we met up with the Bat and the Hose-Beast, and only failing to find one of the geocaches we moved into Pluckley. Finding the cache at the church was relatively easy. We were then planning to walk on to another cache a way away, but it started raining. The Hose-Beast had some choice words to say on the matter, and we went into the Black Horse to shelter from the torrent. 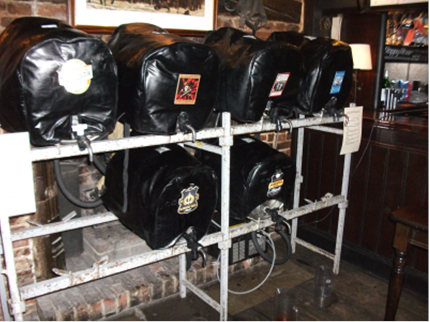 By some amazing co-incidence the Black Horse was staging a beer festival; so we felt it would be rude not to have a couple of their offerings (including half a pint of the aptly-named "Thunderer"). Back to camp where Steve had arrived. We pitched his tent and then did some Hosey-caching. Hosey-caching is basically home-made geocaching, and the principle worked vary well. An entertaining time was had by all until the light began to fail, So we had tea - chicken casserole - and took the mickey out of "Worzel" until beer was abandoned in favour of port. We staggered to our beds at 2am. Hic! Within minutes of climbing into my pit last night the rain started. It was heavy; bordering on to torrential, and it went on all night long. The Rear Admiral texted me at 6.10am to ask if I wanted to go fishing. I soon heard that my reply made him giggle, I stayed in bed listening to the rain and sulking about the rain until 8am when I got up, abluted in the rain, and sulked about the rain in the mess tent. We had a leisurely breakfast in the rain, and washed up in the rain. And with no sign of the rain abating I formally declared Emergency Plan B (beer) to be in effect, and helped myself to the generous servings of the home brew. Which wasn't really the best thing to do becase just as I started the fourth pint so the weather cheered up and visitors arrived. It wasn't fair that Sarah wasn't well, but Steve came out, as did the O'Latas. Whilst the (supposedly) grown ups sat and chatted and dyed their hair, the littluns played "Beer Can Pinyata" and made their own home-made poo-sticks (from poo and sticks). Tea was good - sweet & sour and all sorts of goodies with it. It was a shame that I dozed through much of the afternoon and evening, but I recovered enough to do a rather amazing rendition of "Foo-Foo the Bunny Rabbit" at the camp fire before we adjourned for port and cheese; finally crawling into our pits at 1am. I *could* have done a spot of early morning fishing, but I really couldn't be bothered to get out of my pit. I finally emerged about 8am, and had a spot of fishing then with Steve. Whilst I fished, the Hoseys photographed. As an experiment I stopped using maggots as bait and tried some old boilies I'd found in my tackle bag. They worked to a degree. I caught fewer fish that i would have with maggots, but they were bigger; including two huge ones that got away. Brekkie was good as always. There was a problem in that the milk had gone off in the heat. I was fine. I can drink black coffee. And as everyone went off to collect others or to do shopping I went back to the pond for some more fishing. Steve was soon back with Sarah, who was feeling better. Andy and Julie came out too, as did Keith and Amy. And with the sun out we enjoyed a good afternoon. Initially we had some excitement. 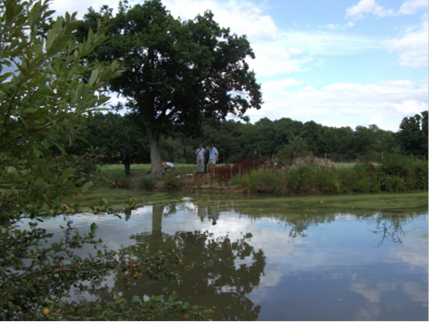 One of the duck houses had slipped its moorings and needed someone to swim out to retrieve duck house and moorings. As always if swimming in duck ponds is required, I am the main man. Swimming was quite refreshing on a hot day, as was the crafty pint I had afterwards. More fishing, more sitting about, we had a really good afternoon. Tea was none too shabby either. Fajitas are always good, and tonight’s were especially good. 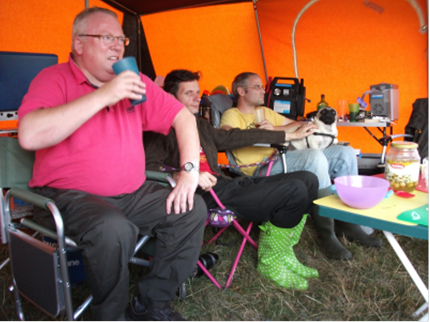 And with tea done and washed up we sat round the camp fire until late. All too soon we had to wave farewell to our visitors, and as people slowly left the fire and went to their beds I sat by the fire and dozed. I would rather sit with people and doze than go to bed. But tonight I gave the port a miss; I was feeling a tad under the weather. Last night I wasn't the last one to go to bed. I had a bit of a sniffle, and was hoping it wouldn't develop into something worse. So I took myself off to bed. I woke feeling surprisingly chipper. I was pleased about that. 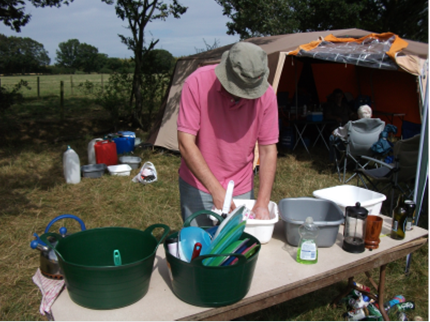 A spot of early morning fishing, a bit of tent tidying, a Stilton omelette, and soon we were all busy packing up the camp site. 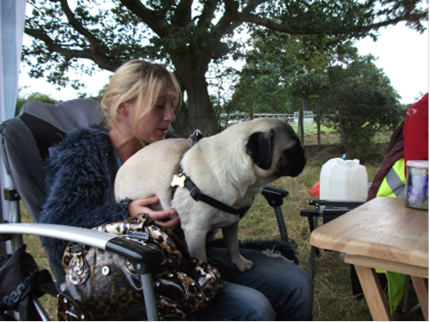 I was rather miffed as I took my tent down. Again I found that the footprint groundsheet of our tent had done precious little other than to have collected a small lake of water under our tent; thereby delaying packing the tent away by at least half an hour whilst we waited for the thing to dry. This isn't the first time that something like this has happened. I am seriously considering abandoning the whole concept of footprint groundsheets. And just as we were about to bring down our mess tent the rain started. So the tent has been left up. We'll get it down in a few days once it's dried.